The capital of the Cantabria region on the north coast of Spain is Santander. Famous for seafood and the bank, Santander is also home to my boyfriend – a.k.a. The Spaniard. I first met him two years ago and just a week after he arrived in Edmonton. He was shy at first, but from the beginning he has always raved (and complained) about how much better the food was back home. So, when I booked my trip to Santander, my first ever trip to Spain, my palate and my belly had some high expectations. I was arriving a day early, but when I got off the plane my friend Adrienne was there to great me. Conveniently her and her boyfriend were planning on living in The Spaniard’s city for two months. She immediately took me to the grocery store where I was amazed by the quantity of quality Spanish meats available, we didn’t even have to go to a speciality shop. I wanted to buy and taste everything! When The Spaniard finally arrived I had a day to relax in Santander before meeting some of his family over a beautiful meal in his sister’s backyard. It was an excellent intro to a traditional home-cooked meal. His sister Cristina made me my own bowl of gluten free salmorejo topped with pork and boiled eggs; perfect for a hot sunny day. His brother-in-law Antonio grilled some fresh bonito on the BBQ. And the table was lined with an assortment of starters including melon with Spanish jamon, tortilla, and fried sardines. The Spaniard’s nephew was happy with candy for dessert. But I opted for a couple of servings of arroz con leche. All his family agree that his godfather’s wife makes the best version ever. It did not disappoint and I had a handful of questions about her recipe to see how close I could come to recreating the creamy dish on home. (Which is why I needed the second bowl – to taste test you see). The north coast of Spain is famous for pinchos, a small snack typically eaten in bars, which are affordable bites which can tide you over or be a filling meal if you eat enough of them. While I couldn’t take part in bar-topped dishes, I could admire the cheap eats The Spaniard and my friends enjoyed whenever a craving arose. Perhaps there is a gluten free pincho bar in Spain, unfortunately I just didn’t find it. Eventually I did get to indulge in a bar treat at El Mercado del Este. After The Spaniard triple checked there was no chance of contamination, I was able to try a pan-fried guilty pleasure. Fries topped with chorizo and an egg, my first sartendada de jijas was delicious! During my visit to Santander there were a few trips to the market to pick up fresh fish, cheeses and fruits. I could see why The Spaniard has high standards – the quality of ingredients were incredible. Some fish was certainly scarier than others. A great chef I know says the uglier the fish, the better it tastes. He may be right because both times I had monkfish it was lovely. The Spaniard told me these barnacles are a delicacy – I have to take his word for it because I didn’t get to try these bottom-of-the-boat dwellers. This cheese merchant found a special place in my heart. Thanks to his vacuum packing skills I was able to bring a few Cantabria cheeses back home with me. And of course I indulged in anchovies. Famous from the north of Spain I had the pleasure of taste-testing some The Spaniard brought back after Christmas. A small jar of these salty guys is pricey but so worth it. I was very entertained by the fresh milk vending machine in El Mercado del Este. Watching The Spaniard fill my Canadian water bottle with fresh milk was certainly worth the euro. A highlight of the week was a visit to El Nuevo Molino, a Michelin star restaurant just south of Santander. Housed in an old mill, we were seated at a table with a view of the garden where our meal started with a welcome glass of sweet wine. 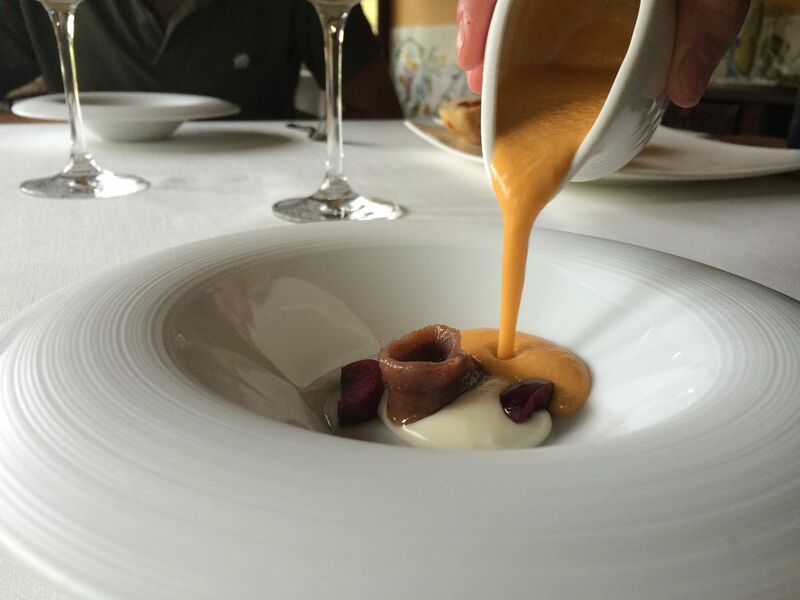 The amuse bouche was an anchovy with cream and cherries, topped with table-poured gazpacho. The Spaniard was given a hearty supply of gluten-filled bread, so he was open to sharing the meal (with the understanding he would dredge the plate clean with bread after I was done each dish). To start we had pil pil cod served with mushrooms, a crispy purple potato and pepper juice. Melt-in your mouth delicious, the cod was not only the prettiest dish of the day, it was my favourite dish at El Nuevo Molino. White asparagus on cream cheese and anise. Our mains included a delicious confit pork belly served with a citrus glaze. And a much prettier looking monkfish than I saw at the market. For dessert The Spaniard had the tarta de manzana (apple tart). We asked for the bill but before it arrived we received this berry sorbet and bits and bites of pastries and chocolate; a very delightful way to finish our meal. Two and a half hours later and we said our good bye to El Nuevo Molino. It was a beautiful afternoon and a lovely meal – I will certainly remember our first Michelin star experience together. You would think we would have been full from our afternoon lunch, but The Spaniard had more eating planned. Our day of sightseeing finished in San Vicente de la Barquera – a fishing town famous for seafood. So we ordered Mariscada – a platter packed with lobster, prawns, mussels, clams, and crab. It was seriously labour intensive – it took us almost two hours to crack our way through it. The next day I was invited for lunch at Casa The Spaniard for lunch with this parents. His mother prepared a dish native to the neighbouring province Asturias. We started with Fabada, a white bean stew served with chorizo, panceta, and blood sausage. Our second dish was lubina, or European seabass, roasted with lemons and garlic. I have to say, I was getting used to a daily dose of fish. I also enjoyed a few glasses of calimocho – red wine and coke. The combination sounds horrible, but topped with ice it was surprisingly refreshing. The coke also gives you a jolt of caffeine to get you through a late night of drinking with The Spaniard’s friends. I think that my most gastronomically-packed day of Spain was the wedding we were in town for – but that deserves another blog post so you’ll just have to wait for those food-envy photos. My final day in Spain was spent back at The Spaniard’s sister’s home where Antonio, who is originally from the south, was making paella. While The Spaniard has made me plenty of paella’s back in Canada, this was the first and only one I tried on my trip to Spain. The Spaniard told me Antonio makes amazing paella and we watched closely to learn his tricks of the trade. I forced The Spaniard to take as many photos as possible as I was busy holding his new nephew Pablo. Packed with clams, prawns and monkfish – Antonio’s paella was delicious. Enjoying a traditional Spanish dish with The Spaniard’s family was the perfect way to complete my culinary adventure on the north coast of Spain. The Spaniard did not over sell it – the food in Cantabria is definitely worth coming back for. The cheese we brought back won’t last long – I’m already craving another taste of Santander.